All Extraction Systems incorporate a progressive series of filters designed specifically to maximize life for both particulate and gas capture. 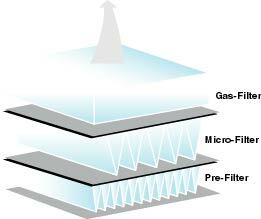 The pre filter is designed solely to protect the life of the micro filter. For the majority of units, X-KAR use a pleated synthetic media with a separation of typically 95% of particulate down to 0.8 microns. In cases where larger amounts of sub micron particulate are generated, a higher efficiency filter can be fitted or stand alone Bag filter can be installed to give greater life to the pre filter and ensure adequate protection to the main filter. The Micro Filters incorporate a series of bonded webbing between the pleats. This feature not only ensures even spacing between each pleat, but also alleviates the possibility of airflow vibration or collapse through pressure build up during gradual filter saturation. Each Micro filter is designed to withstand up to 6 times the maximum operating pressure for its designated unit. With filter efficiency of 99.997% down to 0.3 microns and 95% as small as 0.01 microns. The standard gas filter is made up of a 50/50 mix of Activated Aluminum Potassium Permanganate and Activated Carbon. The media neutralizes a broad base of chemical and VOC (Volatile Organic Compound) pollutants. A comprehensive range of specialized filters together with electronic gas sensing is available for more demanding or diverse applications. All filters are produced in accordance with ISO9002 with micron filtration complying with BS3928. A certificate of conformity for each filter is available upon request.